One of the big issues with delegating tasks in multi-user environments is keeping track of the tools and information vital to the shared tasks. 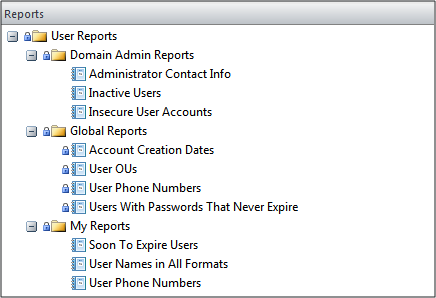 Telling your coworker Paul to handle the password reset requests on the support desk is a great idea, until you realise that Paul doesn't have access to the password reset tool you've created that sends the user an email with his new password and the amount of time he has to change it himself. ADHQ provides an easy way to coordinate between ADHQ users with Resource Sharing. Resources saved in folders starting with “My” are saved to the local machine that the ADHQ User Client is running from. These resources are not shared with other users that are using ADHQ and, if you log in to the service from another computer, you will not have access to them. Resources saved under a folder with your profile name are shared with any other user who logs in to that same profile, no matter which computer they are running from. The profile level is a great place to share resources that are job-specific or useful to multiple ADHQ users. Resources saved as global resources are available to all users running the ADHQ user client, from any computer. By default, all built-in ADHQ reports and collections are stored at this level. Sharing a resource at the Profile or Global level will potentially allow it to be modified by other users. We recommend keeping a local copy of any important resources that you share, to ensure the original copy sticks around unchanged.